Injekt LLC is a company known for developing useless advertisement-supported software applications, and there is no surprise that its latest product Magical Find is no exception to the rule. 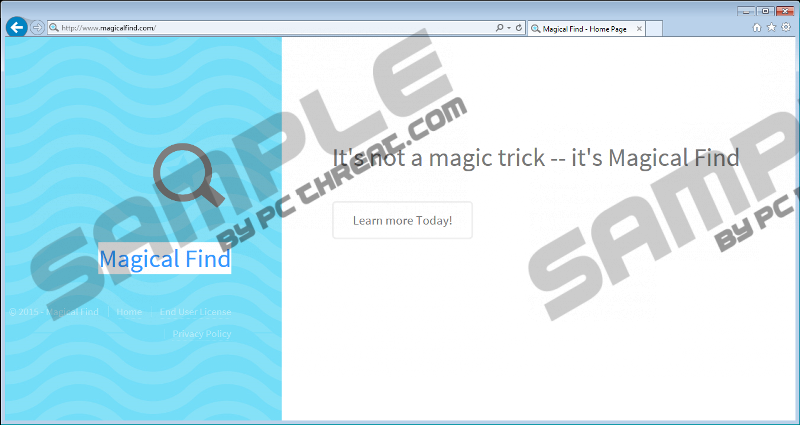 The title of this program implies that the application should do some magic in helping you find things you search for. However, creators of Magical Find did not even bother themselves to promote the program on the official webpage and the true reasons why this program was developed remain a mystery. We believe that it was created only for advertisement purposes and, thus, should be removed. Recently, we paid our attention to some programs developed by Injekt LLC, such as Wander Burst, Deals Avenue, and Positive Finds. All those programs work in a similar way. They collect marketing-type data on you using various information collection technologies, including web storage data, cookies, pixels, and beacons. All the collected information is used to attack you with ads. The advertisements could be shown in a form of banners, pop-ups, and coupons. You will encounter ads generated by Magical Find during your Internet browsing. They are obnoxious, but this is the least negative thing we can say about them. The real danger lies in the fact that advertisements are supported by third parties. Magical Find not only shares information on you with those third parties but also bears no responsibility for any damage you may suffer after clicking on the ads. The third-party websites where you may find yourself redirected could contain a malicious code. You could be infected with a dangerous Trojan horse, and it would cost you a lot of time and money to completely clean your computer. Magical Find is the program you cannot download from any official source. So, it came to your computer in a bundle with some program you have recently downloaded. Programs like this adware application usually come as an additional option, and it is possible to deselect them. However, the vast majority of users are not careful enough, and they run through the installation wizard without paying close attention to it. Thus, programs such as Magical Find enter computers and start their shady work. We recommend that you waste no time and remove Magical Find before it is too late. It is not a hard task as the standard way of removing unwanted applications via Control Panel works in this case as well. Just follow our short guide and the program will be gone in a couple of clicks. But do not forget that your computer may already be infected with more dangerous threats that came together with this adware application. It is almost impossible to get rid of all these threats in a manual way, and you will need a legitimate antimalware program. If you want a piece of advice on what tool to choose, do not hesitate to contact us by posting a comment or addressing us via social networks. Go to Add or Remove Programs and uninstall Magical Find. Simultaneously tap the Windows key + X. Go to Uninstall a program and uninstall Magical Find. Simultaneously press the Windows key + I. Open Uninstall a program and remove Magical Find. Quick & tested solution for Magical Find removal.